Blower driven anti-static bar is connected to air apparatus designed to neutralize the static charges which cause troubles at large distances. Due to high technology used in design it became possible to produce more efficient results for solution of static electric troubles even in high speed applications. It provides high performance and efficient ionization with fast discharging time. Anti-static bar separate air molecules to positive and negative ions by the electric field, generate and then transport them in the direction of charged objects by the air apparatuses. Any statically charged product passed through the efficient distance of the bar will attract the opposite charged ions and neutralize the product. That will prevent sticking of product to other product or parts of machines. In addition, such electrical dangers as current striking, explosion, fire and dust attraction will be also prevented. Blower driven anti-static bar does not need any calibration and because of being simple in care enhances the quality, safety, hygiene of machine and provides its longer life. 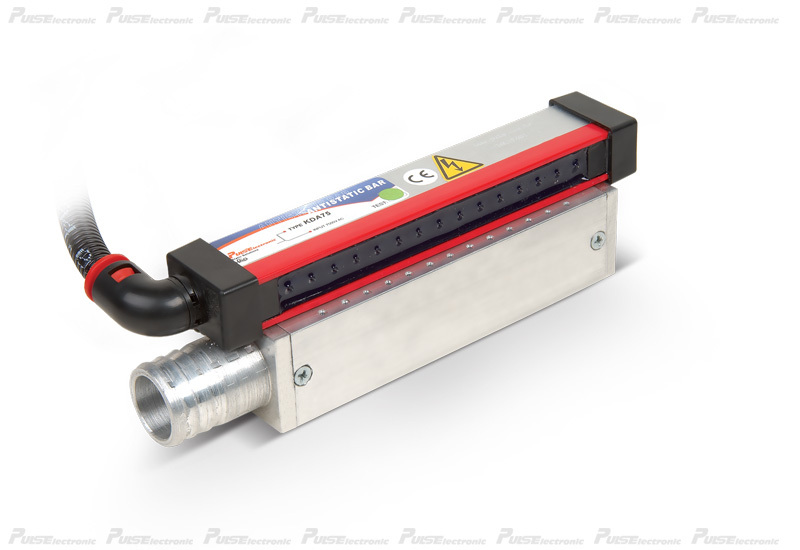 Blower driven anti-static bar is connected to high voltage resistively. Thereby its emitter pins even if they are touched will not affect by electrical current. Air passing trough blower must be clean and dry. It can be installed in restricted places. According to application it can be produced in different length. : Input Voltage - max.7500VAC. : Puls Anti-static power supply 3 GKA75 SER.